Yao attended the Rockets-Wizards game Monday night (photos are below), but didn’t take any questions from the press about his future plans. However, Rockets GM Daryl Morey did give an interview with the Chinese press, which Raymond has translated in the forum here. The biggest takeaways for me were that the Rockets have been in constant communication with Yao since it was announced Yao will miss the rest of the season. This dialogue is a good sign that whatever decisions will be made, either side won’t be surprised (remember the drama from McGrady when he said he was going to undergo microfracture surgery, completely surprising the Rockets’ medical staff?). 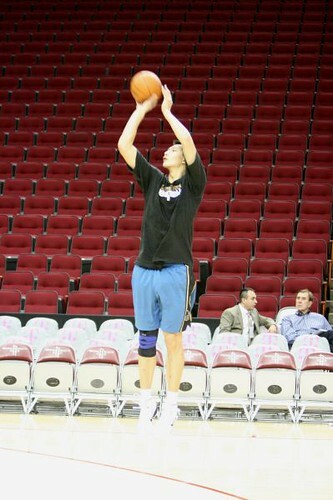 Yao also has been doing upper body workouts at Toyota Center, and that surgery may be the option Yao takes instead of resting the ankle until it heals. Yi Jianlian, who was traded from New Jersey to Washington before the season began, shot the ball before the game. Yi, who is recovering from an injury, didn’t play in the game, but should be able to play very soon. As soon as Yao got hurt Wednesday night against the Wizards in the first quarter, I could hear all of the chatter on all the online forums from panicky Rocket fans about how Yao is washed up, they can’t count on him, his career is over, yada yada yada. I say to those folks, “Relax.” We’ll learn more tomorrow after a scan is done on his foot. Maybe the good news is that Yao said after the game that the problem felt like it was more in his left ankle, further away from the surgically repaired area in his left foot. Yao runs up the court in Washington a few minutes before checking out of the game with an injury in his left leg/ankle area. 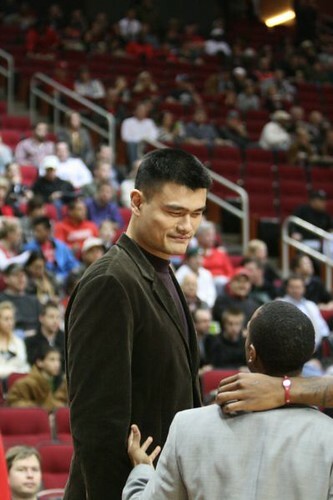 Click here for more photos of Yao from the game, as well as other Rocket players and Washington Wizard Yi Jianlian. I know the Rockets are struggling, now with a 1-6 record after losing to Washington tonight. One more loss and they’ll have the same record as the Dallas Cowboys. Not good. But coming into this season, we knew there was a very good chance that Yao may not be able to play a full season. So if he’s out for a few games, or even a couple of weeks, you had to know they had built Yao’s prospective absence into their plans. That’s why they went out and got Brad Miller as his backup. And you know Miller had to think he might get significant minutes because of Yao’s health, which probably helped him make the decision to sign with Houston. We all know Miller isn’t the answer to be the starting center for extended minutes, but there aren’t that many centers out there who are. Maybe talks will flare up again with Erick Dampier, who could give Miller some relief, after discussions were suspended a few days ago, thereby saving Jermaine Taylor‘s spot on the team. We’ll know more tomorrow about Yao’s ankle situation. If it’s an absence for more than a couple of weeks, you’ve got to think they’ll sign another big to provide more help to Miller and Jordan Hill, who has been coming along lately. As far as the game went Wednesday night, the Rockets fought hard without Aaron Brooks and Yao. Kyle Lowry finally got some playing time. But the Rockets collapsed again in the 4th quarter, holding a one-point lead, only to get outscored 8-0 to have the game put away. I won’t go into all the details of the game, but the main problem is the same as all of the other losses this season: no one can step up to score late in the game. Of course, Shane Battier disappeared in this game altogether, scoring 0 points in almost 24 minutes. That’s absolutely ridiculous. When Battier doesn’t score, the Rockets lose. I’m kind of getting tired of hearing about how Battier is a “glue guy” when the team is 1-6 and the Rockets need everyone to step up. I love Luis Scola and I’m glad the Rockets signed him to a longer term deal, but I think the Rockets are really missing Carl “Mr. 4th Quarter” Landry. 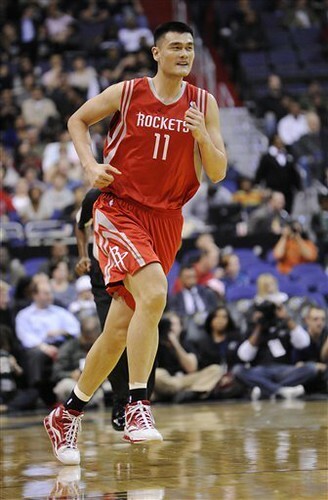 You could really count on that guy more than any other Rocket in the fourth quarter to step up, even more than Yao. He helped the Rockets win so many games in the when he was here, and his absence is deafening now. I think having Landry and Scola in the lineup at the same time in late-game situations would have been a formidable front line. I like who we got in return for Landry — Kevin Martin. He’s been great overall, but in the fourth quarter he hasn’t really put the team on his back like Landry did. Maybe he will become that go-to guy. Someone needs to do that consistently. Is it time for the Rockets to try to pull-off the Carmelo Anthony deal? After going 1-6, not as many people, including me, could blame them for doing it. The Rockets are playing against the Washington Wizards right now. 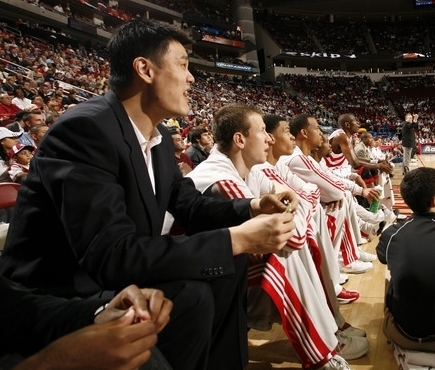 Yao played 5 minutes of the first quarter, then later went to the locker room where he has been diagnosed with a tendon strain in his left ankle area. It looks like Yao strained it jumping up into the air, then fell backwards. He didn’t land on anyone’s foot and didn’t grimace when he fell. Only after he took a few steps did he show any pain. I wonder if Daryl Morey is calling Erick Dampier’s agent right now? Yao Ming greets in street clothes his teammates as they prepare for their matchup against the Washington Wizards. Inspired to play well without Yao the rest of the season, the Rockets soundly beat the Wizards 94-69. For more photos from the day’s events, click here. What a day. After all the drama from this afternoon regarding the shocking news about Yao, there was a game to play against the Washington Wizards Tuesday night. It was probably a good thing for Yao’s teammates to focus on a game right away rather than let any depression and/or doubt get a chance to fester over a day or two. Last time I checked, the Utah Jazz don’t have a dominating big man in the middle, and the Rockets have just as much talent as them, yet the Jazz get more respect (they probably don’t get enough IMHO). Almost the same situation with Dallas, too. They don’t have a dominant big man in the paint, and the Rockets roster is probably just as dangerous as theirs. Another small consolation is that with the Rockets banding together in perhaps an “us against the world” mentality, it takes their mind off the distraction of their winning streak. Suddenly their win streak doesn’t seem as important as proving everyone wrong that they can win without Yao. It’s a slight distinction, with the difference being the streak is something you’re afraid to have end, whereas winning without Yao is something you can’t wait to prove to others you can do. Passive versus active. Well, the Rockets came out Tuesday night as strong and determined as you could ever hope them to be in beating the Wizards 94-69. Dikembe Mutombo started at center, not Luis Scola or Carl Landry. Yao Ming shoots over Antawn Jamison on Tuesday night in a 92-84 win over the Washington Wizards. 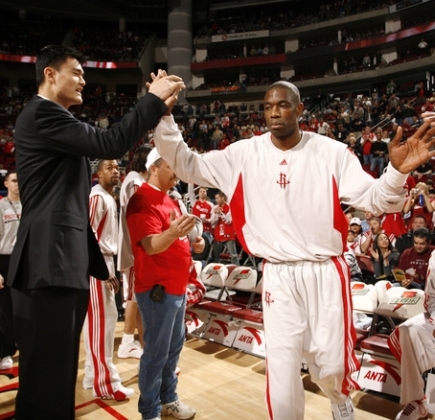 Yao scored 21 points and Luther Head added 24 to help the Rockets win their third straight game. Click here for more photos from the game. It’s kind of strange to write about a Rockets win on the road that came fairly easily, this time in Washington against the Wizards. The Rockets won 92-84 in a game where they led by as much as 14 points. Sure, it got close at times, but the Rockets always found a way to keep the Wizards at arms length most of the way. Their defense was fantastic, holding them to just 41% shooting, and the out-rebounded them 46-28. 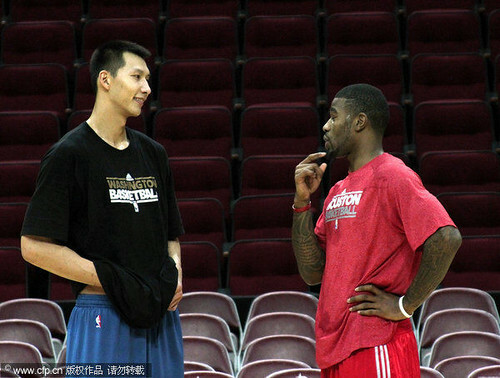 Luther Head (24 points) and Yao Ming (21) scored 45 of the Rockets’ 92 points. Half of Luther’s points came on 3-pointers, hitting 4-of-6 from behind the arc. This came only one game after it looked like he might be the odd man out with Aaron Brooks‘ emergence as a legitimate scoring threat. Brooks scored 22 points Saturday night against the Knicks and is on his way to a very bright future in the league. Add Tracy McGrady’s imminent return to the line-up soon, and Rafer Alston‘s dramatic scoring improvement recently, and things didn’t look good for Luther in getting as many minutes this season. But if Luther continues to shoot like he Tuesday night, then for the first time this season it looks like the Rockets will have some scoring depth at guard after all, even with Steve Francis and Mike James riding the bench. Who would have thought that at the beginning of the season? Before training camp it looked like Alston was on his way out of town, Luther was an afterthought once again, and Brooks was ‘only’ a rookie. Yao goes airborne to chest bump Juwan Howard after Yao hit a backbreaking shot with 11.4 seconds remaining that helped beat the Washington Wizards. 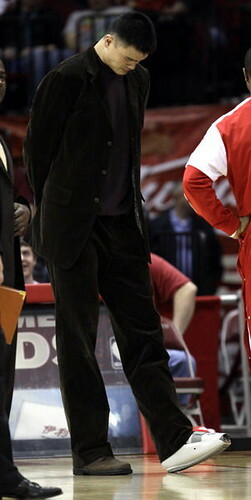 Yao scored 23 points in the fourth quarter alone on his way to 38 points, 11 rebounds and 6 blocks. Click here for more photos. I have seen a lot of fantastic performances by Yao over the past 5 seasons, but the game he had Saturday night against the Washington Wizards ranks as one of his best ever. With an ailing T-Mac in the locker room because of back spasms (oh no, not again! ), Yao took over and scored 23 points in the fourth quarter on a perfect 6-of-6 shooting from the field, and 11-of-12 from the line. His points mainly came from unstoppable fallaway jumpers, capped with a baseline jumper while falling out of bounds with 11.4 seconds remaining to expand a one-point lead to three, 112-109. The Wizards’ Gilbert Arenas missed a 3-pointer that could have tied it, and Shane Battier sank two free throws to seal the victory, 114-109. Yao finished with a season-high 38 points on 13-of-19 field goals, 11 rebounds and 6 blocked shots. My goodness, Yao is indeed worthy of NBA MVP consideration. With T-Mac’s back acting up again on a night where he was pretty good himself (28 points on 10-of-21 shooting, but 1-of-5 from three-point range), Yao knew he had to take over in the fourth quarter. It’s comical how the Associated Press writer for the game watered down Yao’s performance and attributed it to Etan Thomas and Brendan Haywood having to leave the game because of injury. There may be just a little truth in that, but to have that be the leading theme in the story smacks of more anti-Yao thinking we had thought had finally been put to rest. You can read the AP writer’s take on the game by clicking here. 1st quarter – Luther Head led a fast break that ended with a beautiful alley-oop to T-Mac for a dunk. I hadn’t seen that from the Rockets in awhile. 2nd quarter – Gilbert Arenas scored 19 points in the quarter alone, at one point scoring 13 of the Wizards’ points in a row. Rafer Alston led a break and faked a behind-the-back pass to T-Mac to juke his defender, then laid it in easily. Very Skip-to-my-Lou-ish! 2nd & 3rd quarter – Alston scored 10 points on 4-of-5 shooting. While Yao is out resting, T-Mac takes over and scores 12 points on 3-of-7 shooting and 5-of-7 free throws. 4th quarter – With the Rockets leading 90-87 with 7:34 remaining, Juwan Howard foolishly fouls Antawn Jamison while shooting a 3-pointer, and on top of that, was called for a technical for reacting to the call, which led to a 4-point play. Big mistake that keeps Washington in the game. But Luther hits two huge three-pointers down the stretch to help the Rockets maintain the lead. Even though Gilbert Arenas scored 41 points, overall, the Rockets defense played very well, holding the high-scoring Wizards to 39.7% shooting. 12 total blocks by the Rockets definitely helped. Houston shot lights out: 55%. Now the main thing that concerns the Rockets is the future of T-Mac’s back. This is much more concerning than the concussion he had last week. If he’s going to continue to have problems with his back like he did last season, then it was a bad night overall, even with Yao’s amazing performance. Click here for the Houston Chronicle game story. Yao goes up to contest a shot by Washington’s Etan Thomas Wednesday night. 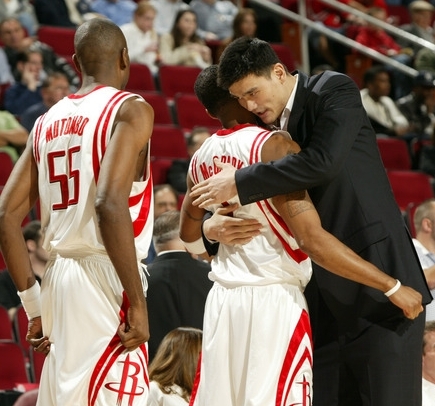 Yao scored 25 points, made 7-of-8 free throws, and grabbed 14 rebounds to lead all Rockets in scoring and rebounding. Meanwhile, the Rockets defense clamped down on the Wizards and held them to 33.3% shooting. The Rockets had scoring problems themselves, turning the ball over 22 times and going on a 1-for-8 shooting drought in the fourth quarter. But Rafer Alston hit a big three-pointer, and Luther Head made some key free throws to help win the game 86-82. Click here for the game story. Click here for more photos. Yao reacts after hitting a huge fadeaway basket in the final minute of the Rockets-Wizards game that proved to be the winning basket. Yao scored 38 points, tying a season high, on amazing 15-of-25 shooting from the field and 8-of-8 from the line. He also had 10 rebounds, 3 assists, two blocks, and numerous intimidations of Wizard shots. Click here for more photos from the game. FRIDAY, 3/31/06 – With nothing really to play for except pride, the Rockets and Yao put on a show against the 37-33 Washington Wizards Friday night, perhaps showing the Rockets blowout win of the Sonics Wednesday night was not a fluke. Even though the game didn’t mean much since the playoffs are out of reach, I was more entertained with this game more than almost any other game this season. Houston fans seemed to get into this game more than expected, getting rowdy many times to urge the Rockets to a moral victory. The Rockets led for most of the game, shot a season high 55.7% from the field, and held on to win for a 105-103 triumph. I have been surprised at how much better the Rockets are playing all of a sudden offensively. With no T-Mac, what has gotten into them lately? The Rockets exploded with 62 points by halftime (they scored 64 against Seattle on Wednesday), shooting 58% from the field and hitting 5-of-9 from three-point land. Yao, Luther Head and Rafer Alston were all in double-figures by halftime. Yao had 20 points by halftime with incredible shooting consistency (7-of-11 from the field, 6-of-6 from the line). That wonderful shooting touch we knew he had before coming into the NBA is really shining through now. It didn’t hurt that the Wizards were without center Brendan Haywood, and weren’t double-teaming Yao since Luther Head’s outside shooting kept them honest from collapsing on Yao inside. Luther was outstanding in the first half, scoring 13 points on 5-of-7 shooting. It looks like all of the playing time he has had this season is really paying off. He is hitting from the outside and attacking the basket with much more confidence, it seems. I think he has a chance to really emerge as a force next season, similar to how Cuttino Mobley became an offensive threat his second season with the Rockets. Rafer Alston was extremely effective, too, scoring 15 points on 5-of-8 shooting and dishing 6 assists. The Rockets led 62-50 by halftime, but it seemed like the lead was much bigger considering much they were scoring. But being the third highest scoring team in the league, Washington is no slouch offensively, right behind Phoenix and Seattle. Man. That’s saying something when Houston – second-to-last in points per game (90.7) outscores two of the top 3 offensive teams in the league in consecutive games! In the second half, Yao kept it rolling, scoring at will with that feathery touch of his and hitting 8-of-14 shots to add 18 more to his scoring pile. He was simply unstoppable against the smaller front line of the Wizards. When he checked out of the game for a rest, the Wizards whittled away a 15-point deficit by going on an 18-4 run, and closed within one point, 87-86, with 8:22 remaining. With Yao back in the game, the Rockets went on an 11-2 run, with Yao scoring eight of those points to give them a comfortable 10-point lead with 4:20 remaining. But the Wizards impressive offensive attack got them back into it, pulling them within 102-101 with 1:15 remaining in the game. With every other Rocket suddenly struggling offensively, everyone knew that Yao – who had 36 points at the time — was going to get the ball on the next possession. It was just like the glory years when everyone in the building knew Hakeem Olajuwon would get the ball in the same situation. And just like Olajuwon did many times, Yao got the ball on the left baseline, made a spin move toward the baseline, faded away, and with the utmost confidence like we have seen so much from him lately, he calmly flicked his wrist and swished it for a huge bucket to give the Rockets a 104-101 lead with 53.2 remaining! (The picture above shows Yao’s reaction seconds after hitting that clutch shot). The Wizards had a chance to win it on a last-second 3-pointer, but unlike games earlier this season where those shots would fall against the Rockets, this time it clanged off the rim for a Houston victory. By the time it was over, Yao had tied his season-high of 38 points (15-of-25 shooting), made 8-of-8 from the line, grabbed 11 boards, had 3 assists, blocked two shots, and had numerous alterations of Wizards’ shots. The only down side is that Yao had 7 turnovers, with a couple coming down the stretch that allowed Washington to get close near the end of the game. But considering how Yao has improved in so many facets of his game, reduction of turnovers is sure to happen over time, too. Yao had plenty of help in this win, with Luther finishing with 20 points on 8-of-11 shooting, 3-of-4 from 3-point territory, and doling 7 assists. Alston finished with 19 points and 8 assists, and was definitely a key contributor in this game. As effective as Alston has been lately, and as much as I want to give him tons of credit, I learned that Mike James had an even more amazing night: 36 points and 10 assists. Right when I want to “move on” and appreciate Alston for what he is now bringing to the team, that trade continues to haunt the Rockets and me. If only we had that production from the backcourt earlier this season when T-Mac was out, we wouldn’t be counting down the end of the Rockets’ season. 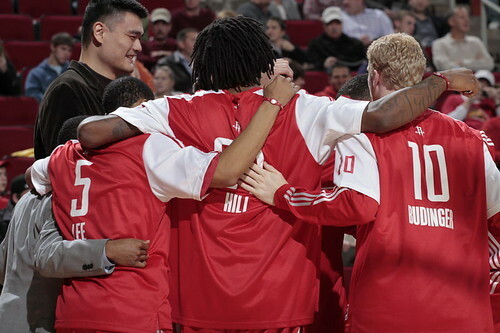 1/3/06, TUESDAY – Unfortunately I wasn’t able to watch the game between the Rockets and Wizards on Tuesday night. I just went through a Travel Day from Hell. Nine hours, delayed flights, lost luggage, delayed hotel shuttle, etc. I heard it was a good game, though. It figures I would miss the game where the Rockets would break their 5-game losing streak and score their highest point total this season, winning 123-111. Although I missed the game, I plan to watch it sometime in the near future. In the meantime, you can read about in the Houston Chronicle’s write-up by clicking here. While the Astros blew another game to the White Sox on Sunday night, the Rockets quietly won a 75-71 squeaker against Washington in preseason play at Toyota Center. Rookie Luther Head continues to play well, scoring six points in the fourth quarter along with a clinching jumper to win it. Yao scored 20 points on 8-of-12 shooting and grabbed 7 rebounds. To read a brief recap of the game, click here. As a reminder, I’ll be providing more in-depth analysis of Yao’s play (and the Rockets’) once the regular season starts on November 2nd. You are currently browsing the archives for the vs. Washington category.